A new system to separate arriving aircraft at Heathrow by time instead of distance will radically cut delays and reduce cancellations due to high headwinds, says air traffic control firm NATS. In what will be a world first, the new method for organising arriving aircraft is set to become operational at London’s biggest airport in spring 2015. Traditionally, flights are separated by set distances dependent on the type of aircraft and the size of the spiralling turbulence – or wake vortex – they create as they fly. During strong headwind conditions, aircraft fly more slowly over the ground resulting in extra time between each arrival. Having to maintain a set separation distance in those conditions therefore reduces the landing rate and can have a significant knock-on effect to airport capacity, causing delays and cancellations. 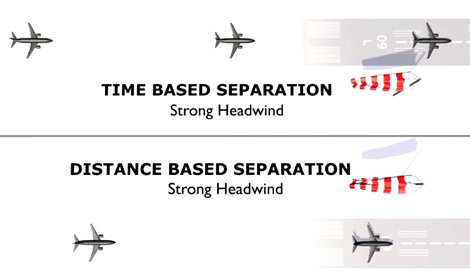 Time based separation will help maintain landing rates in strong headwinds. The introduction of a time-based separation method at Heathrow will help maintain the landing rate and save 80,000 minutes of delay every year – halving the current delay figure while significantly reducing the need for airlines to cancel flights due to the affects of strong headwinds. Supported in the Airports Commission’s interim report in December, the delivery of time based separation comes after three years of exhaustive analysis. NATS has studied over 100,000 flights using state of the art equipment to accurately measure the behaviour of aircraft wake vortices in strong headwinds. The results show that they dissipate more quickly in windy conditions, therefore allowing aircraft to be closer together on final approach. While time based separation is being introduced initially at Heathrow, it would also prove beneficial at other major airports both in the UK and around the world. The deployment of TBS builds on work NATS has undertaken with a number of partners through the European Commission’s SESAR programme and forms part of the UK’s Future Airspace Strategy.